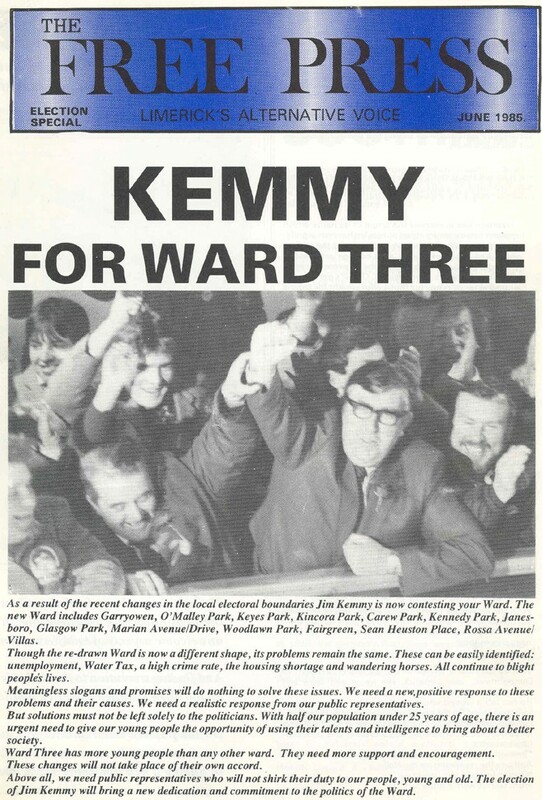 From the 1985 Local Elections, the cover of an election edition of the Democratic Socialist Party paper ‘The Free Press’ which announces that Jim Kemmy will be standing in Ward 3. He was a founding member of Irish CND and also involved with The Irish Anti-Apartheid Movement. 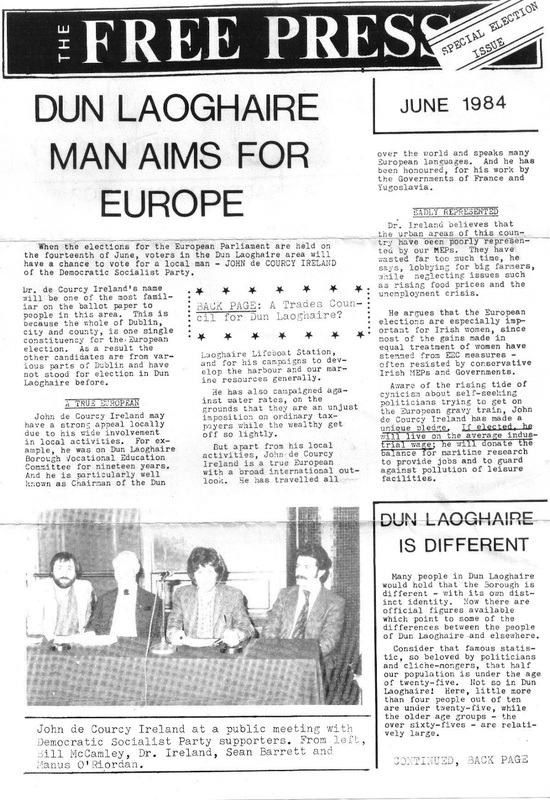 This special edition of ‘The Free Press’ was published for the Euro Elections of 1984. John De Courcy Ireland was the candidate. He polled 5,350 votes. John De Courcy Ireland had a long and varied career and is associated by many with the Maritime Museum in Dun Laoghaire. Amongst those pictured with him are Bill McCamley, Sean Barrett and Manus O’Riordan. Both Bill McCamley and Manus O’Riordan have been involved with SIPTU since. Amongst other titles Manus O’Riordan has been SIPTUs Head of Research, whilst Bill McCamley has been a Worker Director at Dublin Bus. The leaflet also contains some interesting facts regarding religion, age, gender of Dun Laoghaire as well as topics that may be of interest especially those in/from the Dun Laoghaire area. Should you want to read it easily, Clicking on the image will increase its size. From the November 1982 General Election, a Flyer for John De Courcy Ireland running for the Democratic Socialist Party in Dun Laoghaire. Despite the calibre of the candidate he polled 1,036 votes. The Democratic Socialist Party were founded by Limerickman Jim Kemmy who had been elected to the Dail initially as an independent. They lasted until 1990 when they joined up with Labour. Labour TD Jan O’Sullivan and Councillors Michael Conaghan, Eamonn Maloney are former DSP members.